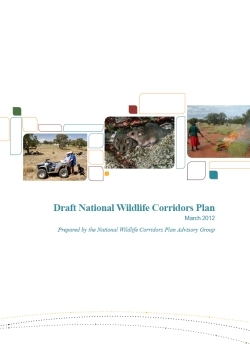 Pannell Discussions » 212 – Wildlife corridors: the next big thing? » Ideas in economics, environment, policy and more. 212 – Wildlife corridors: the next big thing? There seems to be a lot of interest in wildlife corridors as a strategy for nature conservation at the moment. The push is for very large corridors, hundreds of km long in some cases. Reflecting this interest, the Australian Government put together a committee that has developed a ‘Draft National Wildlife Corridors Plan’. Having read the Plan, I can see that the corridors idea has appeal, but I think there is a need for caution when the Government decides how enthusiastically to embrace it. Despite these claims, and other similar ones in the document, I found the case for corridors made in the Plan to be underwhelming. The claimed benefits seem rather rhetorical and non-specific. I would have liked to get clearer and more specific information about the environmental benefits of corridors. It’s about ‘connectivity’, which ‘is a fundamental requirement of healthy, productive landscapes’, apparently, but what, specifically, does connectivity help with? Which types of flora and fauna, or which types of ecosystems, are expected to do better if we invest in corridors? How much better would they do? Are these organisms and ecosystems particularly important, compared to others? If resources are concentrated in a large corridor project, is the whole really better than the sum of the parts? What is the evidence? The absence of this sort of information from the Plan is liable to make one wonder if the information is actually available. It appears that ecologists are not uniformly enthusiastic about the corridors idea. Decision Point, the magazine on research about environmental decision making, has presented a range of views on the subject. Hugh Possingham (in DP#26) seems to be an agnostic, suggesting that we don’t yet have the evidence that spatially connected investments deliver a greater outcome than those investments in isolation, but arguing that it’s worth testing. On the other hand, Carina Wyborn (in DP#58) argues that, even if ‘connectivity provides an uncertain metric for effective conservation’, the corridors idea is worthwhile because it inspires and motivates people to get involved. Suppose it’s true that a whole corridor is better than the sum of its parts, and that the intuitive appeal of the corridor concept helps to bring more landholders and other stakeholders on side. Are these things sufficient to be able to say that corridors should be a high priority for public investment in the environment? They help, obviously, but they are not sufficient without a broader assessment of the issues. As argued by Hodgeson and colleagues, investment in a corridor would need to be weighed up against investment in the best alternative approach that could be purchased with the same resources. The fact that corridors are large, operating at the ‘landscape scale’, is put forward as one of their advantages. That’s fair enough, but there are also disadvantages from concentrating a lot of conservation eggs into one large basket in this way. The most important disadvantage, in my judgement, is that by concentrating resources into a particular corridor project, there may be an increased risk of spending a share of the money on changes that provide relatively low environmental benefits. Areas may get resources because they are in the right place to connect to the corridor, rather than because they help address an important and tractable environmental problem. The spatial heterogeneity of environmental problems, values and solutions is so high that I am very confident in the benefits of cherry picking. Can we be confident that the benefits arising from connectivity are greater than the benefits of cherry picking? From what I’ve read so far, such confidence seems unlikely to be justified in general. Maybe it is justified in specific cases, but this needs assessment to decide which cases. Looking at it that way, there is a question that worries me. The benefits of cherry picking are big and pretty obvious, so if the benefits of connectivity were even bigger, they ought to be obvious too. It seems to me that it’s not at all clear that connectivity generates benefits that could be big enough to compete with cherry picking. Does this mean that the benefits of connectivity aren’t all that big? I am not arguing that corridors are bad. I am arguing that their benefits need to be big enough to outweigh the alternatives. Whether the benefits are big enough is not self-evident, and there are reasons to suspect that they might not be, so careful assessment (and perhaps further research) is needed before we should spend a lot of public money on them. Posted on 22 April, 2012 by David Pannell. This entry was posted in Environment, Latest, Natural resource management, Policy. You see similar arguments with regard to the volume of water required to return to the environment in the Murray. Without x gigalitres, the Murray will be unsustainable, and therefore you can’t have agriculture. This is less than convincing rhetoric.Exactly what facet of river unsustainability will make agriculture unsustainable? Thanks David, Its a simple point that you make very nicely. Before we invest heavily, we need more than just fluffy words about the value of corridors, we need evidence that these things will deliver greater biodiversity benefits than alternative investment options. There has been significant global investment in iconic corridor conservation projects, but I have seen no attempts to measure the benefits of these investment approaches compared with other approaches such as targeting investment toward mitigating threats like urbanization or predator proof fences where they are most needed etc.. It is great that the government is investing something in biodiversity, but I’m concerned that we will not get the greatest biodiversity benefits from the investment if it targets areas simply because they can be ‘connected’. We need to do our best within the conservation corridor plans to ensure that the things we invest in within the corridors are those that bring the greatest biodiversity bang for our corridor buck. I’m looking forward to seeing how connectivity corridor investments are prioritized to ensure this is the case. Tend to harbour ferals ( cats, foxes, rabbits), but also breed up large numbers of kangaroos, ready to have car accidents and maraud crops. Level of cooperation between landholders is wildly erratic, as is their level of commitment to the project, leaving disjointed areas within the corridor which are disfunctional and just breed weeds. I am from WA wheatbelt, and there are very few fauna species which survive and would be able to use the corridor. Most are birds, which will use the corridor for food and shelter, but they don’t need the corridor to connect to anything because they can fly. Flora rarely moves because of the high weed competition in the corridor. I have coined my own theory of connectivity, which is called the spider web theory of innovation. A project which is isolated, but works will be admired by the neighbour and added to, if the need is there in that landscape. Agricultural and natural resource management innovation spreads best across the fence, and spreads through the catchment as each farmer responds to innovative practice change and peer group pressure. Many innovative ideas like minimum till started this way. Unfortunately, our bureaucrats tend to look on small isolated projects as not worthy of their time or money. Vegemite approach is another snide remark made of them. On another note, why are tree planting projects becoming so damn complicated? They are trial sites, have paperwork requiring a portion of the trees planted to be used as carbon to cover the paper produced. A triplocracy, or maybe a quadruplacy ( Do you think that is the right word?) is required to shunt the paperwork around between local, regional, state and federal levels of highly paid functionaries. Surely in science when we prove something conclusively, the effort of proving it should reduce. For instance, we use E = MC squared, and don’t have to constantly keep proving it. Surely the environmental benefit of trees is conclusive and proven. I am a lower tier on ground professional, being bogged down by bureaucracy on a grand scale. I would love to see you explore this phenomenon. As you can probably tell, I am a frustrated doer, and believe that we are not achieving the environmental runs on the board that we could be, because of a bloated bureaucracy. I am always available for a chat. David’s argument in favour of targetted projects is based on assertions such as ‘pretty obvious’ advantages and the like. Hardly helpful or convincing. What David does not seem to be aware of (he is an agricultural economist) is evolutionary and wider biodiversity considerations, particularly in the light on increased fragmentation of ecosystems, climate change and widespread extinction at local and regional scales, all based on very solid theoretical and applied knowledge. A quick review of the literature shows that there are hundreds of articles on that subject, for example plant species with restricted ranges directly affected by climate change wich are likely to become extinct because of lack of ecological connectivity. David could also inform himself of landscape scale conservation undertaken by the Nature Conservancy in North America over the last 30 years pioneered by Prof Ehrlich. Probably the answer as always lies is in an appropriate mix of both local and landscape scale projects. I say the benefits of a targeted approach are pretty obvious because it is trivially easy to show that, when you have a high degree of heterogeneity between potential investments, and the available funding is sufficient to support only a minority of the investments, there are very large benefits from selecting the best projects. I could explain this in more detail if you need. You seem to have missed or misinterpreted my point. I did not say that there would not be benefits from corridor projects. My point is that it is not clear whether the benefits from a corridor project would be great enough to displace other investment strategies. Comprehensive assessment of the relative costs, risks and environmental benefits (not just those related to connectivity) is needed to determine this. We should not assume that corridors are the best use of funds without such assessment being conducted. If corridor projects come out of the assessment looking good compared to the alternatives, then fine, they deserve our support. If the evidence is as strong as you imply, they have a chance, although there is much more to consider in the assessment than the point you raised. The existence of species with restricted ranges would be relevant to the required assessment, but in itself doesn’t show how substantial the benefits would actually be. I’m asking for an assessment that goes beyond that level of argument. By the way, I think it’s usually best not to make assumptions about someone’s knowledge or expertise on the basis of a simple label that you think defines their discipline. For what it’s worth, I usually introduce myself these days as an environmental economist. I’m a member of the Environmental Decisions Group (http://www.edg.org.au/) with a bunch of ecologists, some of whom have publicly made exactly the same point I’m making here. I’d like to see the evidence for the proposition that cherry picking (setting up under-managed reserves, for instance) gives you a better bang for your buck than putting native vegetation back into bare, rural landscapes via large scale biodiverse corridors. I’m with Mike Archer – all disconnected blocks (no matter how big) are essentially fragments open to assault from pest plants & animals as well as hostile or apathetic neighbors. And if you were concerned, in particular, about climate change you would want to create north-south corridors for plant-animal movement. The priority ought to be putting back a web of native veg across all landscapes along with changing cultural values so as landholders generally value the importance of healthy, biodiverse landscapes. Clearly, the traditional narrow shelterbelt is a predator trap. 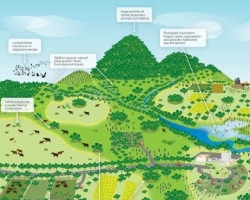 As highlighted in the Australian Forest Grower’s publication, Recreating the Country (www.afg.asn.au), connectivity only works where it is combined with bulk and strategic location; e.g along biodiverse-rich riparian zones. Strategies, such as widespread farm forestry, could play a pivotal role in building both resilient rural communities and healthy, resilient landscapes. I would have thought the evidence of what happens with bird species, such as grey-crowned babblers and regent honeyeaters, demonstrates the importance of, at the very least, maintaining bushland ‘stepping stones’ across landscapes. The young male babblers need somewhere close by to fly to find a mate and nest or their family faces genetic decline and disappearance, as has occurred in southern Australia. Regent honeyeaters follow flowering plants on a seasonal pattern from way up north to the Strathbogie Ranges in Victoria. Break the habitat chain and the bird numbers plummet – as the evidence demonstrates. With cherry picking, it’s all too easy to concentrate on ‘iconic’ places and let the rest go to hell, fire and high water. Hardly a sustainable strategy. Why do you think that ‘setting up under-managed reserves’ would be a good example of cherry picking? My intended meaning of cherry picking is that you actually go to a fair bit of effort to assess the competing investments and choose the ones you have confidence will deliver the best bang for the buck. If under-managed reserves do not deliver a high level of environmental benefits for the money with sufficient confidence, they would not pass muster in the assessment process. Like an earlier commenter, in your argument that corridors should be the top priority for investment, you seem to assume that the only consideration is whether corridors would generate benefits if they were put in place. This is far too simplistic. * the risk of not receiving the long-term funding needed to maintain the project benefits. There are many thousands of environmental projects we could invest in, with high heterogeneity on all of those factors. The level of public funding that’s available is sufficient to do only a small proportion of those thousands of projects. (My rough estimate is that the budget is about 1% of what we’d need to fix the lot.) That combination of factors means that the benefits from a well targeted approach (e.g. choosing the best 1% of projects) are massively greater than the benefits from a set of average projects, or even a set of above-average projects. In my view, your comments about changing the cultural values of landholders is naive. To achieve the degree of change you’re contemplating would have to be one of the most difficult and expensive changes we could contemplate. In fact, we already tried something like that, in the Landcare program. It’s well accepted that it did change many farmers’ awareness of environmental issues, and for some it changed their values to some degree, but overall, the resulting changes in behaviour were small relative to the scale you’d be looking for. Following that experience, Landcare is now rather out of favour at the policy level. My judgement would be that it is not realistically possible to change landholder’s environmental values by more than was achieved in Landcare. In addition, any attempt now would have to overcome the baggage that Landcare has left. The traditional approach of buying up land and turning it into reserves has generally led to under-management. Long term operational costs and management plans have not followed in the wake of the capital and PR expended to ‘save’ whatever fragment of the landscape is targeted. Landcare may have proven less than perfect, but I would have thought adaptive management requires finding ways of fostering custodianship by landholders, rather than tossing it in and vacating the paddocks and properties that constitute the vast bulk of rural Australia. Interesting article David, I agree with the points you are making. It did occur to me that there is one assumption underpinning your arguments that might be worth pointing out. You are assuming the funds proposed for a given wildlife corridor project would also be available for other conservation interventions. I wonder whether the iconic and large scale nature of these projects could result in funds becoming available that would otherwise not be spent on conservation? In this case it would make it more difficult to compare the funding of large scape corridors with your “cherry picking” approach. Good point. If the money for corridors is new money, the environmental benefits would be additional. The money still comes from somewhere, though, so it is still worth thinking critically about the benefits of corridors to consider whether it is worth diverting money from other public investments. Dave, you could replace ‘wildlife corridor’ with ‘water’ and your argument (which I agree with) would apply to returning 2,750 GL of environmental water to the Murray Darling Basin. CMAs in my region believe that ‘just adding water’ is not going to solve their most pressing water-related environmental problems (e.g. pest fish species, water quality, lack of riparian vegetation, erosion). Your question about ‘how much better would they do’ applies equally to water. I call this the ‘dose-response’ relationship. We don’t know what quantum of ecological benefit we get per GL of additional environmental water (e.g. improvement in fish numbers, bird breeding events or extent of river red-gum). CSIRO have called for this work to be done, and recognise this issue as a key weakness in the MDB Plan. Hence, the 2,750 GL is based on restoring flows at key indicator sites (which are basically river gauges used as a proxy for flows near key ecological assets) to get those flows somewhat closer to ‘pre-development’ flows. But will that provide ecological improvement in all cases? Will the extra water actually reach ecological assets and will they respond? Could we get a better and more cost effective response by doing some works that improve environmental watering, but require far less water to be diverted from production? Perhaps with some cherry picking, we’d get much better bang for our buck with only 500 GL? Some quick reactions. Connecting remnant bush may sound commendable; but are you also connecting remnant weeds & pests? Paying for connecting remnant stands may be commendable but who manages the associated biological threats of invasive species? Exactly how less stranded do natural assets become by being joined? Is the opportunity cost of using land for forming corridors always sufficiently low (& benefits sufficiently high) to justify the linking? These are interesting research questions.